Perfect for the holidays, especially against a red door. At the bottom of our lane is the old 'English Holly Farm' where decades ago branches would be harvested and shipped to the east coast. The processing shed and wax dipping tank remain but the business has long closed, leaving behind over 100 mature holly bushes for birds and humans alike to enjoy. At this time of year the bushes are studded with clusters of red berries like so many jewels, especially magical when dusted with snow. Holly plays a role in folklore from pagan times as well as being a symbol of the Christmas season when the berried stems are used in wreaths and flower arrangements. 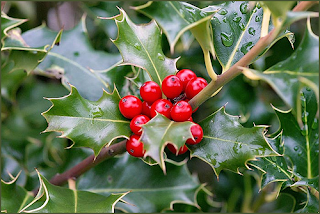 There are hundreds of holly (Ilex) species so you can always find something to suit your needs whether you are looking for a dwarf foundation plant or an evergreen tree. Besides the typical dark green foliage there are blue and variegated varieties and shapes can vary from columnar to weeping forms making it possible to select a specimen feature, or something for screening. There are even thornless forms of these versatile shrubs and all are easy to grow – no wonder they are popular! Another bonus for many of us is that the deer leave them alone. 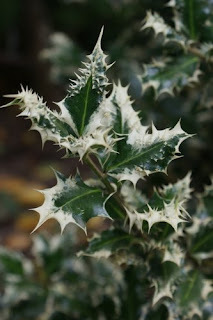 In this post I’m going to focus on the English hollies (Ilex aquifolium) so traditional at this time of year and what many of us think of as a ‘true’ holly. These are hardy in zones 6-9. Hollies are dioecious plants, which means there are male flowers and female flowers located on separate plants, with the female plants producing berries. For this to happen there needs to be a male plant within 2 miles to allow for pollination although closer spacing will give better results. Even when you have fruiting plants, you will occasionally have a large crop, followed by a year with few to no berries. If you have a plant that does not produce berries there may be several reasons: a late freeze may have damaged the flowers, hot, dry summer weather caused the berries to fall, or you pruned your shrub hard removing the flower buds. Most cultivars require well-drained soil and prefer full sun, although they will tolerate partial shade. They do best in a slightly acidic soil, but will thrive in soil that has been amended with organic matter and are remarkably drought tolerant once established. 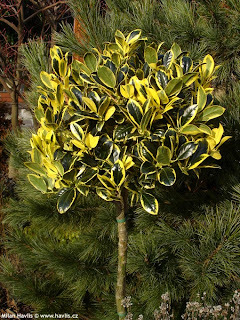 Be sure to prune away green shoots from variegated forms. In the Pacific Northwest the English holly has been given a bad rap as an invasive species which is taking over the countryside (Paul Revere must have made it to Seattle….). King County has written articles on this which you can read here. Certainly I would have to agree that the basic species (i.e. not a named variety) seems to spread easily since we have seedlings appearing in parts of our garden even though the holly farm is some distance away. They seem to find their way into the most awkward of places too, typically within the roots of Douglas fir trees which make them difficult to remove. However the Northwest Holly Society disagrees with this evaluation; read their article here. 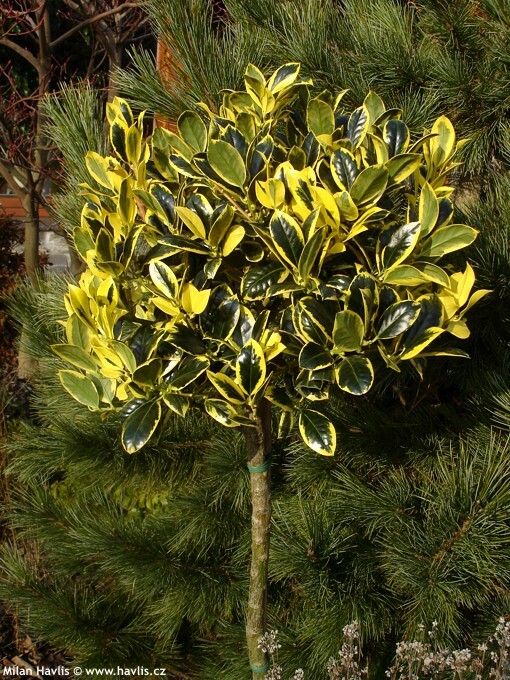 If the standard English holly is not a problem in your area then they make a beautiful large specimen tree which can take hard pruning, making them especially suitable for topiary. In my experience the more decorative varieties typically found in nurseries do not cause a problem and I use them frequently in both landscape and container garden design. One of my favorites is ‘Gold coast’ English holly with its bright green and yellow variegated foliage. Reaching 6’ tall and wide this holly makes a colorful screen or accent but also works well in larger containers as it can easily be pruned to the required shape and size. 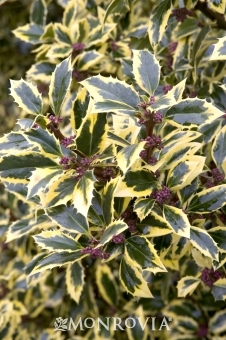 The commonly called variegated English holly (‘Argentea marginata’) has creamy yellow margins and produces an abundance of red berries when pollinated. If pruning is needed this would have to be done in late winter so as not to sacrifice the berries however. This is a larger plant than ‘Gold coast’ reaching 20’ tall and 12’ wide over time. ‘Santa’s delight’ offers blue-green foliage edged with creamy white which changes to pink in winter making this a highly ornamental variety, especially when studded with red winter berries. 12’ high x 8’ wide. ‘Silver hedgehog’ (‘Ferox argentea’) is spinier than most and produces a dense thicket which maintains its creamy white variegation well in shade. Great color and texture. Want a change from red and green? 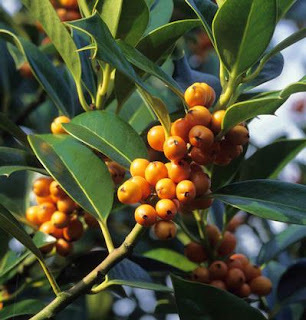 ‘Amber’ produces apricot toned berries which show off nicely against the bright yet thornless green foliage, forming a small pyramidal tree. 'Golden van Tol' is the golden-leaved form of an excellent, almost spineless holly that produces red berries whether or not there are other hollies nearby. It has dark green, glossy leaves most of which have a thickish golden margin; some leaves are almost completely golden. It makes an upright tree, eventually 10ft tall. 'Golden van Tol' is a sport of 'J.C. van Tol', which is the choice of those who don’t like the combination of yellow and red. Both have purple shoots. For narrow spaces the columnar ‘Siberia’ may be the answer growing just 6’ wide but 15’ tall; perhaps an excellent change from the overused Arborvitae! 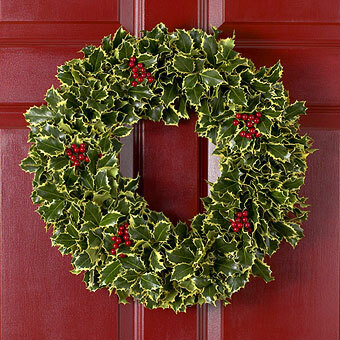 This has the more traditional glossy dark green foliage and an abundance of red berries. Anything is fair game when I am deigning container gardens. I’m not afraid of using varieties which will ultimately grow larger than I need since I can either prune them or transplant them into the garden. Life is too short to deny myself the pleasure of a great plant! Sunny spots offer the opportunity for companions such as the dark leaved Weigela ‘Midnight wine’ and the golden spiraea ‘Goldmound’ for a color echo. Within the landscape this framework could be built on by using a purple smoke bush (e.g. Cotinus coggygria ‘Grace’) as a back drop. Dark green varieties need something bright to show them off. Red or yellow twig dogwoods grouped in front would provide a wonderful winter vignette in sun or part shade while golden elderberries (e.g. Sambucus racemosa ‘Sutherland gold’) would offer a three season bright note for part shade, substituting this with golden ninebark (Physocarpus opulifolius ‘Dart’s gold’) or golden smoke bush (Cotinus coggygria ‘Golden spirit’)in sun. Holly therefore provides interest well beyond Christmas. This would be a great time to purchase a potted specimen for the holidays but transplant it into your garden in January for year round enjoyment. That's is a lovely variety of English holly also. So many to choose from! Stacy - I wasn't familiar with the desert holly, but I see it is one of the barberry family which I also love (and a are equally deer resistant). Funny that you think of "the holly and the ivy" as sounding exotic - to me it is English countryside!! I love how you "design" with your plantys, using such beautiful contrasting colors. I'm still trying to get color in my garden year long. I recently started my own blog. Would you mind checking it out and giving me any pointers, on gardening or blogging? Thanks! No-one is an ignorant gardener - we just have varying levels of experience so don't be so hard on yourself! I'm delighted that you enjoy my blog content. That's the sort of feedback that makes this all the more rewarding - sharing the fun. I'd be happy to give you feedback on your blog but can't see an email address for you on your blog page. Send me an email of karen@lejardinetdesigns.com and I'll shoot a few ideas and thoughts your way. I love the look of holly. I have "Gold Coast" growing in the front yard -- I keep nursing it along. I just have to remember to be careful when I'm cleaning around it -- if not, it will remind me with a handful of spiny leaves. A bit like trying to work around barberry's!